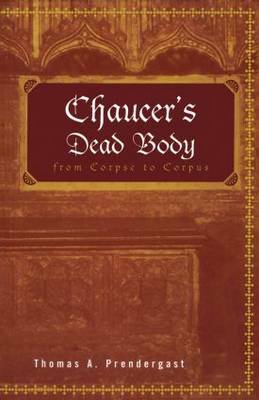 "This book is an ingeniously conceived account of the relation between the physical tomb of Chaucer and its place in the development of Chaucerian studies. Along the way, however, this account becomes more than merely ingenious in its excavation of a deeply compelling logic that links memorialization and canon formation. This is, in short, no mere 'Chaucer study.' Prendergast's examination of what is at stake not just in the history of Chaucer's tomb but also in the historiography implicit in Chaucerian criticism and the changing forms and interests of Chaucerian necrology is ultimately a kind of history of English literature, an account of the medievalisms implicit in the assertion of positive and negative literary values from the fifteenth into the twentieth centuries, from Thomas Hoccleve to T.S. Eliot. It should certainly appeal to literary scholars of all historical persuasions, and certainly will appeal to medievalists." "Thomas Prendergast weaves an intricate, complex, and multiply-layered argument, which begins with the 'fact' of the transfer of Chaucer's body from its original tomb to its location as the 'cornerstone' of Poet's Corner and which continues by exploring the anxieties occasioned by this removal in their connection with the processes of establishing Chaucer as the 'Father of English Poetry.' Given its topic, this book is genuinely original and intriguing. Grounded in research that often opens untapped sources, it locates itself squarely within and makes its own significant contribution to recent theorizations of the body in medieval studies, at the same time that it traces the dual preoccupation with Chaucer's status andwith preserving his tomb to England's preoccupation with its own legitimacy as an imperial force and identity."